Spring Break Camp has never been more fun! 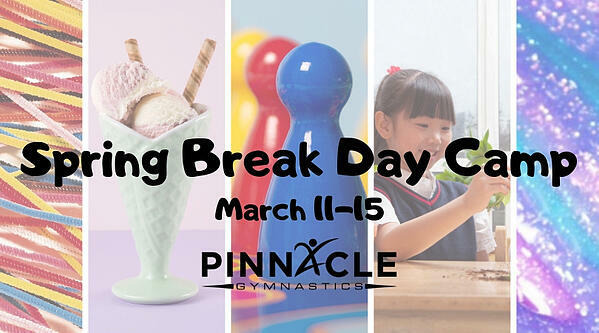 Drop the kids at Pinnacle for a morning, afternoon, or full day of fun! 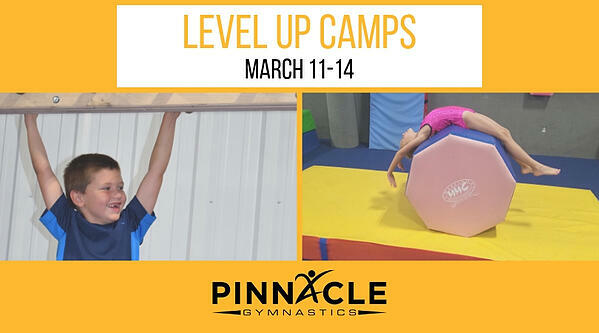 Pinnacle Gymnastics offers morning camps for ages 3 and up and afternoon ninja camp for ages 5 and up. All camps include a variety of in gym activities, themed fun, and a snack. What: Join us for a different theme each morning during Spring Break! Campers will enjoy gymnastics, games, crafts, and a snack. What: Ninjas will have the chance to try every ninja obstacle throughout the week! Each day will have a different theme using different equipment and parts of the gym. Participate in the full week for your best shot at conquering the final Ninja Challenge! Test out your athletic ninja ability working on running, jumping, and (of course) conquering our warped wall! Show off your grip strength, body control, and hand-eye coordination to beat our climbing obstacles such as our climbing ropes, ladders, peg boards, rock walls, and our cliffhangers! Athletes will work on body control, strength, hand-eye coordination, and agility. All are needed to work through our hanging rings, bars, and more. Can you handle the challenge of our most difficult ninja obstacles? With the skills you have learned in the previous days of camp, see if you can conquer the challenge! Here are some more ideas for some Activities for Kids Kansas City!